Shifting and misalignment of surrounding teeth: An empty space in your dental arches can cause surrounding teeth to shift, move, and rotate out of position. 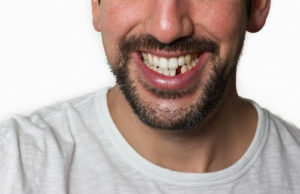 Not only can these misalignments lead to a crooked smile, but severe malposition can negatively affect your bite and make it difficult to chew. Bone loss and gum recession: The absence of a natural tooth root to stimulate the jawbone can cause the bone to deteriorate, weakening your oral structures. Additionally, the lack of tooth support often causes gum recession, which can dislodge healthy teeth and leave the area susceptible to bacteria buildup and infection. In general, the longer a missing tooth remains unfilled, the more bone loss and gum recession is experienced. Changes in facial shape: As the volume of your jawbone gradually decreases, the height of your face can shorten and lead to less distance between the nose and chin. This can create a look of premature age as wrinkles develop and the lack of structural support causes the cheeks to flatten. Jaw misalignment and difficulty biting: With the shifting of surrounding teeth, the upper and lower jaws may become misaligned and increase the risk of TMJ disorder, a condition that refers to jaw joint dysfunction. The symptoms of TMJ disorder typically include orofacial pain and a limited range of jaw motion, potentially compromising the ability to bite with ease. Fortunately, there are many different ways you can replace any number of missing teeth, from a single tooth to an entire dental arch. Our dentists in Fair Lawn offer an array of treatments to restore the full integrity of your oral health and smile, including dental implants— an option that is often considered the gold standard of tooth replacement. Dental implants are meant to act as a natural tooth root and can anchor a state-of-the-art restoration to your jawbone. This can help prevent bone loss and gum recession while looking and feeling like a natural part of your mouth. For more information on dental implants, or our other replacement options like dental bridges or dentures, please contact our practice today. « What Are the Health Benefits of Invisalign®?